At 11 am on 11 November 1918, the guns on the Western Front fell silent after more than four years of continuous warfare. The war still remains one of the deadliest conflicts in the history of the human race. Over 16 million people, both military personnel and civilians, died as a result of ‘The Great War’. 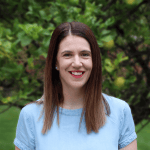 In 1997, Governor-General Sir William Deane formally declared November 11 to be Remembrance Day, a day where all Australians were asked to observe one minute’s silence at 11 am to remember those who died or suffered for Australia’s cause in all wars and armed conflicts. It is natural for us to think of the people when we stop and reflect at this time, but it is also important to remember the other group that fought alongside them, that assisted them on their journey, that provided essential support, transportation and critical service: the animals. On the 11th hour of the 11th day of the 11th month, we will remember them. Horses, donkeys, mules, dogs, even pigeons were amongst the millions of animals that served and who subsequently lost their lives within World War One. Their dedicated and vital role within WWI, WWII and other conflicts is integral and is one that should also be remembered on this day. Throughout WWI, horses were used for a variety of purposes: from transporting essential supplies, cavalry and gun horses, even carrying cannons. Unfortunately, over eight million of these horses died within the conflict, according to the Animals in War Memorial Charity. The loss of horses was so significant that by the time WWII had begun so many British horses had been killed that they needed to instead rely on machines rather than ‘horse power’ as there were just no longer enough. Germany and the Soviet Union still employed many horses and lost millions between them. 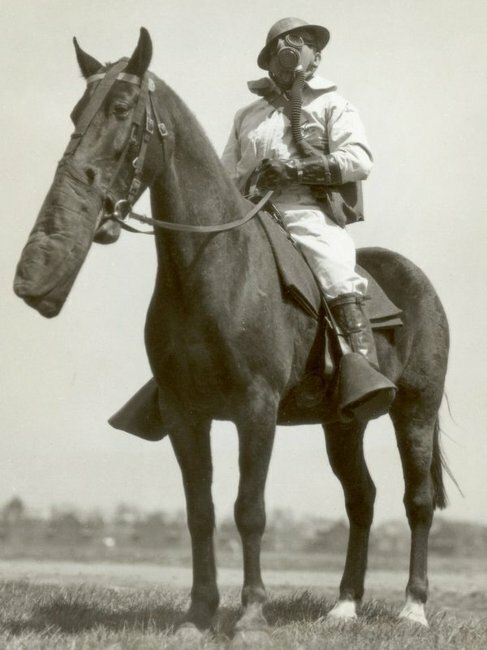 Portrait of Sergeant Joseph Levin of the Chemical Warfare Service, with his horse Buddy. Image: Getty. 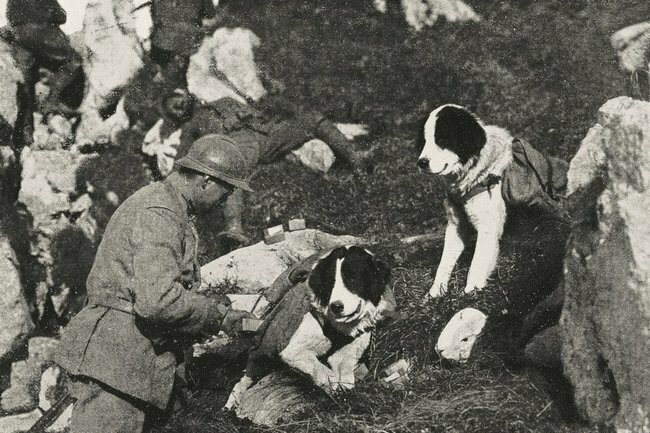 The service of dogs, including Bloodhounds and German Shepherds who often left their safe homes as domestic pets to become patrol dogs, mine detectors and to run messages were also essential in the war efforts. Airedales were even trained to wear specifically made gas masks to help the Red Cross deliver medical supplies. One dog, Rob a Collie was awarded the Dickin Medal for gallantry for making over 20 parachute descents in North America. Horrie, a terrier, saved hundreds of Australian soldiers’ lives in WWII with his exceptional sense of hearing. He would detect the sound of Nazi aircraft much earlier than people and he would alert the troops with a distinctive growl and by looking up at the sky so they could return to their trenches. Horrie was smuggled back home but euthanised due to a quarantine order to destroy all animals returning to Australia from the war. The role of our canine friends continues to be significant within the armed forces, serving still in Afghanistan as explosive detection dogs and to help soldiers with post traumatic stress. Often overlooked and forgotten are the pigeons, of which over 300,000 served in the two world wars, carrying important messages over long distances. One pigeon, Cher Ami, was actually noted as saving the lives of hundreds of British soldiers by delivering her message despite losing her leg and her eye by German fire. Another Australian pigeon was sent into a dangerous tropical storm to deliver a request for a rescue boat, the brave pigeon succeeded and the soldiers as well as the precious cargo, ammunition and boat survived. 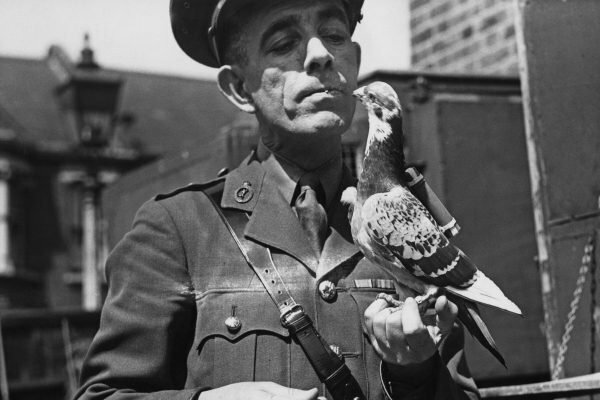 Captain Caiger of the British Army Pigeon Service, holding a carrier pigeon equipped with a &apos;back carrier&apos; message capsule. Image: Getty. As well as the animals who actively served within conflicts, there are also the animals used as mascots who have the important role of raising morale. Many soldiers also took their loyal friends with them to war to help keep their spirits up and for a sense of comfort while in such a perilous situation. Although these animals may not have ‘actively’ served, they were still integral support to those that were. To commemorate the sacrifices, efforts and service of our animal friends that have died during conflict, the Australian War Animal Memorial Organisation has issued a purple poppy to wear alongside the traditional red poppy, to remember accurately how both people and animals served together and often died together, in conflict. Lest we forget all our service men, women and animals. Do you commemorate our lost animals on Remembrance Day? Tell us in a comment below.